Hurricane Sandy has arrived at Cuba's south coast after causing chaos in Jamaica. The hurricane hit land just to the west of Santiago de Cuba and according to the US National Hurricane Centre in Miami its sustained winds reached a maximum of 114 miles per hour. Tourists currently in the Caribbean may have one eye on their travel insurance policies as fears grow Sandy could inflict further damage on Cuba and possibly head for the Bahamas and Florida. 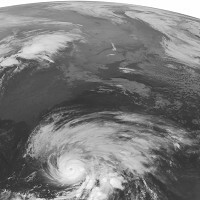 As it hit Jamaica it was classified as a category one hurricane carrying sustained winds of 90mph but it then gained more power as it raced across the open sea towards Cuba. It was the first time for 24 years the eye of a hurricane had directly hit Jamaica and it prompted authorities to close the country's international airports, while 48-hour curfews were put in place in major towns to minimise the risk of looting. Crocodiles were washed away by floodwaters in southern parts of Jamaica and they turned up in areas where electricity had been put out. The eye of the storm passed up through the north of the island and headed past the town of Port Antonio as wild winds continued to batter the rest of the country and the storm made its way on to Cuba.